Dennis Miller went on with Bill O’Reilly Wednesday after the Super Tuesday primaries. Bill O’Reilly: Let me tell you something about Trump. He’s essentially a blue collar guy. I sit there at the game with him and, I mean, we’re not eating caviar, we’re eating hotdogs. And he’s an ex-shortstop. He played baseball. 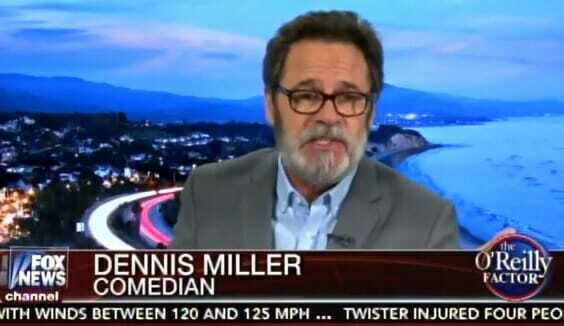 Dennis Miller: All of that seems superfluous. But he’s starting to make some good enemies. And that always intrigues me. Listen Ted Cruz seems like a smart guy but he’s stiff, man. They got to pump some goose grease into those armpits and get him moving. Rubio I’m almost afraid to talk against now. Because I thought I knew him a week ago. I didn’t know him at all. He is a nasty piece of work. And I find it interesting that Rubio only found his voice when tellingly the higher ups in the GOP told him to find his voice. It’s weird to me.